Dreamers Are Us: How to complete Form I-821D? The USCIS could not have devised a simpler form for is clearly a very complicated case. While you can hire an attorney to apply for a work permit under the Deferred Action for Childhood Arrivals process but if you have a basic understanding of English, you can do this on your own. I have reviewed the whole application and nothing really jumps out that is tricky but for the benefit of those who would like to see a sample completed Form I-821D, I am providing one. 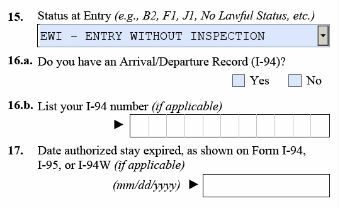 In Part I, under US entry information, for question number 13, it would suffice to provide an estimated date or even month/year, in case you do not have the documentation to prove your illegal entry into the US or do not remember. Similarly for question #14, simply enter the name of the nearest town you are aware of, or even the state, in case you crossed the border. For question #15, the choices are overwhelming. In case you underwent border inspection (in other words, you entered the US legally and were processed by an immigration officer) whatever documentation you have will specify what status you were when you were allowed. For example, if you came as a tourist, you will choose B2. The most complicated is if you entered the country illegally by crossing the border, and in that case you will choose EWI - Entry Without Inspection, as shown below.